Finally Easters coming up, a lovely time to eat eggs and meet family again. That’s what we love about easter, the think we don’t like about easter is that it’s built around consuming sugar! Here in Sweden it’s one of the times at the year when the candy consumption spikes! We have a tradition to hide easter eggs and they should be filled with candy, we have noticed that the eggs get bigger and bigger each year thus containing more candy. We decided that we want to inspire people to eat more healthy and pure this easter, so we also made this brownie 100% free from Animal Products in regards to Earth Hour tomorrow don’t forget to turn of the lights. 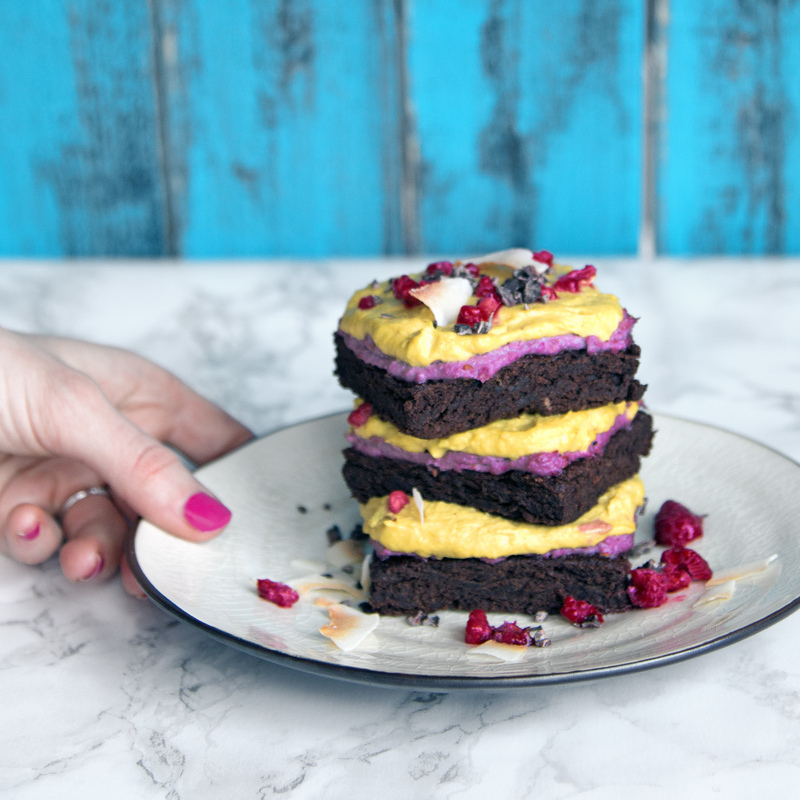 It’s really that delicious this healthy easter dessert recipes that you don’t actually miss the unhealthy desserts, give it a try and let us know what you think about it! Heat the oven to 200 C/392 F. Prepare the topping by placing the cashews in a bowl and cover with water. In a bowl mix the peeled bananas and seed-free dates with a hand blender or in a mixer. Add all the other ingredients and mix it to a smooth cream. Prepare a baking tray with baking paper and pour in the brownie cream and spread it with a spoon or spatula. Now put it in the oven for 12-15 minutes. Take out the cake from the oven and stick in a fork to try if it's ready, it shouldn't be too sticky. If you think it is good you lift out the cake using the paper, let it cool on a grill. Pour off the water of the cashew nuts. With a hand blender you mix the cashew so they will get as smooth as possible. Then divide the cashew cream in two small bowls with the same amount in both. In the first bowl add the raspberries and mix it to a nice blend. Do exactly the same with the other bowl but add the chopped mango. Spread the pink cashew and raspberry cream on the brownies nice and smooth. Follow up with the yellow cream and finish of with some nice toppings such as cacao nibs, coconut flakes or chopped raspberries. Cut the cake into nice squares and it is ready to enjoy!